Multiple Sclerosis is a disease with unpredictable symptoms, making it hard to diagnose, especially in children. Roughly 10,000 kids and teens have been diagnosed in the United States. A Grover Beach teen is among these statistics. "When it first happened, I couldn't walk or talk, eat, I couldn't do anything," said Shea Wilson, 14. Four years ago, Shea's health began declining. "I was diagnosed with pediatric multiple sclerosis," he said. MS is a progressive auto immune disorder common in adults, but extremely rare in anyone under 18. What happens is, the system designed to keep Shea's body healthy gets confused and attacks parts of the body that are vital to daily life. "He lives with things that most senior citizens don't have to live with," said Monica Wilson, Shea's mom. "There is no cure. I am going to have to deal with this for the rest of my life," said Shea. There are good days and bad ones for Shea, which is typical behavior for the disorder. He also takes a long list of medication. Shea's doctor said the goal of treatment is to prevent things from getting worse. "About 20 years ago, there were no treatment. Since that time we have developed more than 10 treatment options. Each of them come with some risks," said Keith Van Haren, MD, Assistant Professor of Child Neurology, Stanford. There are no large studies on kids with MS, which makes treatment a challenge. "In my knee in between the joint, it feels like there is glass," said Shea. He is currently being treated by Dr. Keith Van Haren, who specializes in childhood auto immune brain disorders. 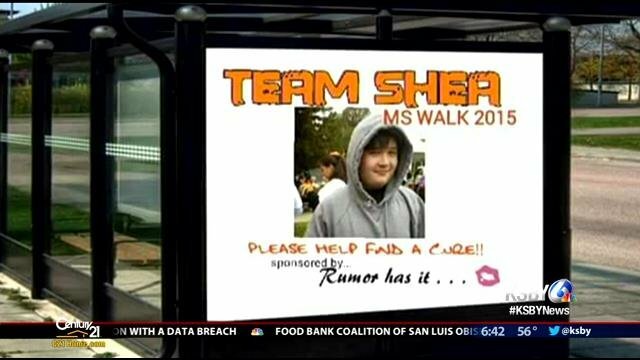 Traveling from Grover Beach to Stanford for treatment has put a financial strain on Shea's mom. "It has made it very difficult for him to find local neurologists who are comfortable taking care of him," explained Dr. Van Haren. "We had to switch his medication simply because he had limited access to medical care and that, unfortunately, is a very common scenario outside of major metropolitan areas." Dr. Van Haren said this is a common scenario for kids with rare disorders. "It would be my wish and the wish of a lot of other doctors that we could have a better health care system that could provide care to more remote areas and help to families in getting this kind of care. Right now our health care system doesn't do this very well. It is a big problem," said Dr. Van Haren. "I have a lot of pain, but I brush it off my shoulder and try to keep moving," said Shea. Doctors say the cause of MS remains a mystery. However, researchers know the nerve damage to the brain is caused my inflammation, but where the inflammation comes from exactly is not known. Family history is a risk factor, according to the National MS Society. Early symptoms can include double vision, weakness in arms and legs and thinking problems, according to the National MS Society.